Personal Democracy Forum. Photo by Luis Carlos Díaz, under a Creative Commons Attribution-NonCommercial 2.0 Generic licence. 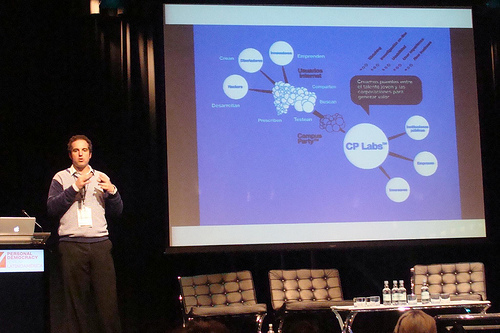 The Latin American Personal Democracy Forum took place on the 18th and 19th of November in Santiago Chile. On one hand lecturers and conference speakers with expertise in areas of technology applied to the media and democracy, among other subjects, gathered together, and on the other hand an audience primarily composed of technologists and people from civil organisations united, all eager to learn about the different experiences offered in the forum. The organisers of the event, Diego Beas and Felipe Heusser talked to the founders of the Personal Democracy Forum, Andrew Rasiej and Micah Sifry, who emphasised the necessity of bringing this conversation to Latin American, with the final goal of building and organising communities. The host Felipe Heusser drew attention to the special characteristics of the Latin American framework, but this does not appear to affect the founders who have already lived through the changes of the conversation produced in the United States with regard to political campaigns. Una de las ideas fuerza que rondó el ambiente en los dos días que duró el encuentro es que la política ya no es una interacción entre un emisor activo (político) y un receptor pasivo (votante), sino que ahora es entre emisores y receptores activos, donde la gente opta por interpelar a sus representantes a través de variadas instancias, ya sea en una reunión, la feria, un puerta a puerta o en la cuenta de Facebook o Twitter del político en cuestión. One of the strong ideas that was circulated during the two day conference is that politics is no longer about interaction between an active speaker (politician) and a passive recipient (voter), but rather, that now it is between active speakers and recipients, where people choose to question their representatives through varied means, either in a meeting, at a fair, during door to door campaigning or on the Facebook or Twitter account of the politician in question. Las palabras de bienvenida … colaron, de entrada, que lo que se venía a conversar era más sobre “tecnología” que sobre “política”. Bastante extraño para un evento cuya consigna, precisamente, era sobre cómo la tecnología estaba transformando la política. The words of welcome….stressed, from the start, that what they had come to talk about was more about “technology” than “politics”. Quite strange for an event whose motto was precisely about how technology was changing politics. Despues del almuerzo –dos sanduchitos de pan de baquete, gasesosa y manzana- participé en uno de los cuatro paneles: “Cómo puede ayudar la tecnología a construir movimientos de base en sociedades desiguales”, una excelente elección. Deanna Zandt, una activista norteamericana muy clara y estimulante, Roberto Lovato de la campaña contra CNN y Lou Dubbs, así como Pepe Huerta de la propuesta chilena por la neutralidad de la red. Cortos, directos y motivantes. Espacio para la interacción con el público. After lunch – two little baguette sandwiches, a soft drink and an apple – I took part in one of the four panels: “How technology can help build grassroots movements in unequal societies”, an excellent choice. Deanna Zandt, a very coherent and stimulating North American activist, Roberto Lovato from the campaign against CNN and Lou Dubbs, as well as Pepe Huerta from the Chilean proposal for network neutrality. Short, direct and motivational. Time to interact with the public. de las exposiciones que más me gustó fue la del ex presidente chileno Ricardo Lagos. Su interés por los temas de nuevas tecnologías no es una novedad, los invito a revisar su discurso de asunción del mando el año 2000 donde habla de la necesidad de invertir en estos temas. The presentation that I liked best was that of former Chilean president Ricardo Lagos. His interest in the subject of new technology is nothing new, I invite you to look at his acceptance speech from the year 2000 [es] where he talks about the need to invest in these areas. A talk which had generated much expectation was that of Claire Williams Díaz from Twitter, but as it was just about to go ahead, the presentation that she had prepared failed, as she herself explains in her blog. She sorted it out anyway, although many were still somewhat disappointed. Una provocación por parte del cerebro detrás de las nuevas iniciativas diplomáticas del Departamento de Estado no exenta de controversia. … Si el acceso (a la red) se garantiza, la ciudadanía se alfabetiza y una buen parte de las luchas políticas se trasladan a las trincheras digitales, la innovación y el cambio —la revolución, diría Ross; yo sería más cauto— se gestarán en la propia red. … En síntesis, lo que Ross quería decir es que si la participación cívica digital lograra alcanzar un nivel alto y la apertura se ensanchara, el cambio social necesitaría cada vez menos de la figura carismática y unipersonal para provocarlo y cada vez más la del colectivo. … ¿Algo de wishful thinking made in USA? Sin duda, pero también contiene una buena dosis de creatividad al imaginar los modelos políticos del futuro y cómo están siendo transformados por tecnologías que permiten formas de participación que hasta hace muy poco resultaban inimaginables. A provocation by the brains behind the new diplomatic initiatives of the Department of the State is not free from controversy…If access (to the internet) is guaranteed, the citizens teach themselves to read and write and a large portion of the political fights move to the digital trenches, the innovation and the change – the revolution Ross said; I would be more cautious – it will grow on the internet itself…In short, what Ross wanted to say is that if digital civic participation manages to reach a high level and the opening widens, the social change would need the charismatic and individual figure to prompt it less and less and the collective figure more and more…A bit of wishful thinking made in the USA? Without a doubt, but it also takes a good deal of creativity to imagine the political models of the future and how they are being transformed by technologies that allow kinds of participation that up until a very short time ago were unimaginable. How much do you have to know, or not to know, about the region to not understand that an American using the example of Che, in any way or manner, is attaching himself to a political third rail? Ross found that out as he immediately drew fire from both the right and left attending the conference. Some Cuban dissidents were audibly horrified that Guevara should be framed as some sort of implied democratic figure, even if Ross was saying that the Web offered a more open democratic channel. … Many on the left present at the conference were equally angered. With what moral authority does a U.S. diplomatic representative raise the example of Che Guevara in any fashion given that it was, quite literally, a CIA-led squad that hunted down and shot Guevara in cold blood — after he was captured and in custody. And exactly what sort of charismatic, or more to the point, strong-armed, individuals has the U.S. supported in these parts not so many years ago? ) The name Augusto Pinochet sort of pops into mind. 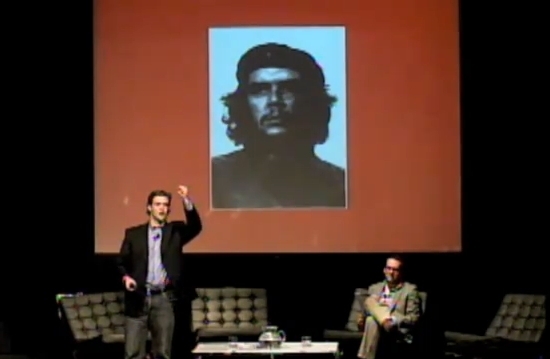 The video of Ross’s talk can been seen here [es]; the mention of Che is at approximately 6:06 minutes. From 24:20 minutes, questions from the public can be heard, firstly one regarding Wikileaks (before the latest leak), then at 27 minutes, one related to Che Guevara asked by a Cuban exile, Ernesto Hernandez Busto, which caused a backlash from some of those present. A pesar de efectuarse el Forum en Chile y de la proclamada intención norteamericana de “ayudar a grupos de la sociedad civil de todo el mundo”, no hubo una sola palabra en el evento para los mapuches chilenos que protagonizan una larga lucha por sus derechos, ni tampoco para los mineros de ese país que luego del festín mediático de su rescate siguen denunciando las oprobiosas condiciones de explotación a que son sometidos. Al parecer, ellos no caben en el concepto de sociedad civil que promueve el PDF. Despite the Forum taking place in Chile and the proclaimed North American intention to “help groups in civil society all over the word”, there was not even a mention at the event of the Chilean Mapuches [es] who are involved in a long battle for their rights, nor of the miners of this country on whom the media have been feasting [es] since their rescue and who continue to condemn the corrupt conditions of exploitation to which they are subjected. It seems that they do not fit into the concept of civil society that PDF promotes. (Lo bueno) Proyectos: la combinación de conferencias temáticas y proyectos tangibles con resultados, procesos y herramientas utilizadas ayudó a tener referencias de cómo se han resuelto temas específicos en cada país como para implementarlo. (Aprendizaje) Soluciones a problemáticas en común: nos dimos cuenta que los problemas sociales en nuestro país en realidad son comunes en la región. Esto nos hace ver que la iniciativa de algunos proyectos que han tenido éxito en un país puede implementar a cualquier otro de la región. (Propuesta) Conexión: como es típico en los eventos que involucran el internet la conexión es fundamental, en el evento falló en múltiples ocasiones incluso para los expositores, tomar en cuenta que este detalle es escencial para que existan conversaciones y retroalimentación. (The Positive) Projects: the combination of thematic lectures, projects with tangible results and the procedures and the tools used, helped to show how specific issues have been resolved in each country, like how to implement the solution. (Learning) Solutions to common problems: we realised that the social problems in our country are in reality common to the region. This makes us see that the initiative of some of the projects that have been successful in one country can be implemented in any other in the region. (Proposal) Connection: As is typical at events that involve the internet, the connection is fundamental, at the event it failed on multiple occasions even for the speakers; take into account that this detail is essential for the existence of conversations and feedback. Una conclusión a la que llegaron casi todos los expositores fue la paradoja de la participación en las redes sociales. Lo que la hace más viable y le da el potencial de masiva, es lo mismo que le da su carácter volátil y en ocasiones vacío: la ausencia de fricción. Entre menos energía tenga yo que dedicar a una causa o iniciativa, es más fácil hacerme parte de ella, pero si esa energía no pasa a las calles, si no se enfrenta al mundo real, si no pasa a generar fricción, no genera chispa. Si la emoción no llama a la acción, no habrá transformación. A conclusion at which almost all the speakers arrived was the paradox of the participation in social networks. What makes it so viable and gives massive potential is the same as what gives it its volatile and sometimes empty character: the absence of friction. The less energy that I have to dedicate to a cause or initiative, the easier it is to become a part of it, but if this energy does not translate onto the streets, if it is not brought face to face with the real world, if it does not generate friction, it does not generate sparks. If the emotion does not call for action, there will be no transformation. Post originally written in Globalizado [es] on the 2nd of December. The first photo is from the Flickr set by Luis Carlos Díaz.